Emerging infectious pathogens present opportunities for nonhuman primate model building, transmission and pathogenesis research, and development of interventions by drawing on the expertise of several investigators at the California National Primate Research Center (CNPRC) and collaborating affiliate scientists. Importantly, the previous multi-disciplinary research at the CNPRC of preclinical pediatric and adult simian immunodeficiency virus (SIV) and rhesus cytomegalovirus (RhCMV) models served as a template for the rapid and efficient development of ZIKV infection and diseases models. 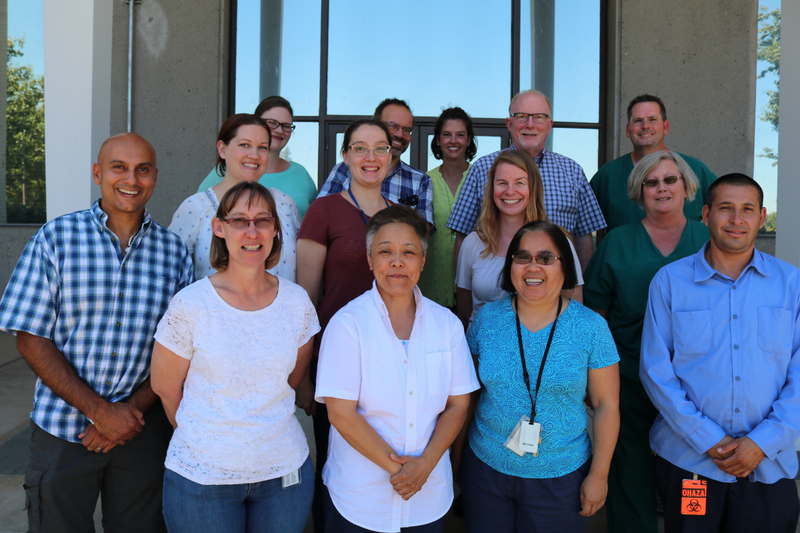 A team of teams, involving multiple CNPRC Scientific Research Units, was assembled to bring the greatest possible combination of expertise and knowledge to bear on this newly emerging animal model of a devastating viral infection that crosses multiple boundaries in virology, immunology, neuroscience, and developmental biology. This is not merely inter-disciplinary work, it is “convergence on the animal” at the level required to impact human health. Importantly, a CNPRC pilot research grant was initially used to support basic efforts at establishing conditions for infection of rhesus monkeys, and subsequently several additional federally-funded grants have been secured. Two recent publications highlight the importance and impact on human health of experimental inoculation studies of rhesus monkeys with ZIKV. In the first study (Coffey et al. 2018), in utero infection of fetuses at CNPRC produced brain lesions (calcification, tissue damage) that mimic those in human newborns with congenital ZIKV syndrome. Additional efforts are being explored to determine inoculation conditions for producing microencephaly, which is manifest in humans. Nonetheless, the macaque model can now be used to evaluate the mechanisms of viral neuropathogenesis and sets the stage for testing drug interventions to block viral replication and damage in the central nervous system. These results were obtained by highly collaborative multi-disciplinary efforts involving several CNPRC core scientists and their affiliates at UC Davis. In the second study (Dudley et al. 2018), data on ZIKV infection at several primate centers were compiled to show that this virus may cause a greater rate of miscarriage than previously estimated from observations in humans. Twenty six percent of nonhuman primates experimentally inoculated with ZIKV in early pregnancy exhibited miscarriage or stillbirth even though the dams showed few signs of infection. Human studies found that about 5 percent of women known to be infected with ZIKV and symptomatic did not carry to term or has stillbirths. Accordingly, in areas where ZIKV is prevalent, the number of virus-related miscarriages and stillbirths may be under-estimated unless asymptomatic infections of the mothers is taken into account. This second study shows the benefits of taking a highly collaborative approach involving robust and open communication among investigators at several national primate research centers (NPRCs). Dudley DM, Van Rompay KK, Coffey LL, Ardeshir A, Keesler RI, Bliss-Moreau E, Grigsby PL, Steinbach RJ, Hirsch AJ, MacAllister RP, Pecoraro HL, Colgin LM, Hodge T, Streblow DN, Tardif S, Patterson JL, Tamhankar M, Seferovic M, Aagaard KM, Martín CS, Chiu CY, Panganiban AT, Veazey RS, Wang X, Maness NJ, Gilbert MH, Bohm RP, Adams Waldorf KM, Gale M Jr, Rajagopal L, Hotchkiss CE, Mohr EL, Capuano SV 3rd, Simmons HA, Mejia A, Friedrich TC, Golos TG, O’Connor DH. Nat Commun. 2018 Jun 20;9(1):2414. doi: 10.1038/s41467-018-04777-6.